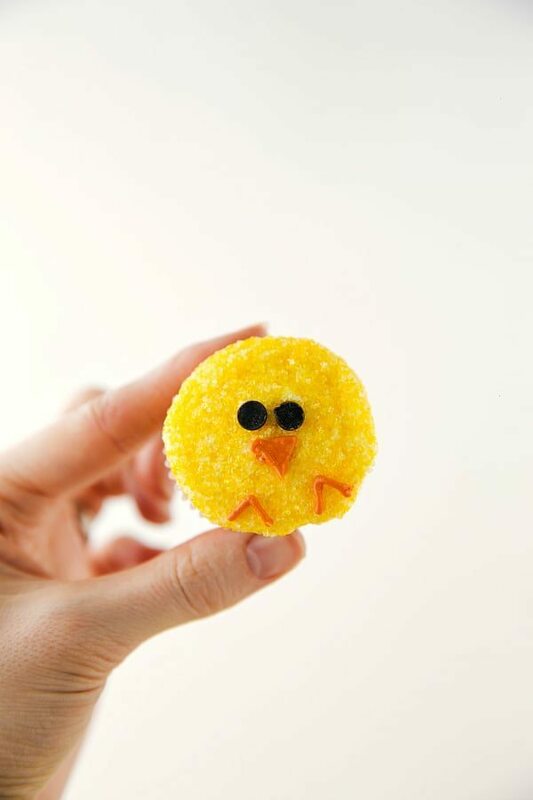 A super quick, easy, and adorable way to decorate yellow cupcakes — made to look like a Spring chick! 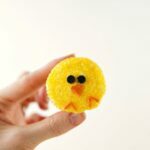 Little chicks are seriously the cutest thing about Spring. Their tiny chubby little bodies, their itty-bitty beaks, teeny webbed feet, and their totally ridiculously adorable puffy feathers. Words just can’t even explain how cute I think they are. ? My friend has passes to Thanksgiving Point farm country (a venue with lots of farm animals, pony ridding for littles, activities, etc.) so we went with them a few weeks back. One look at the new little chicks there and I knew there had to be some kind of Spring treat to look like them. Also there had to be a treat that would make the toddler like chicks because they totally freaked him out. What child have I raised to be scared of little newborn chickies? I don’t even know. ? Of course the ginormous horses didn’t even phase him. But the chicks? Yeah he didn’t even want to get close. If these don’t make the toddler love chicks the next time we see them, I don’t even know what will. Who doesn’t love a mini cupcake that is covered in sprinkles?! 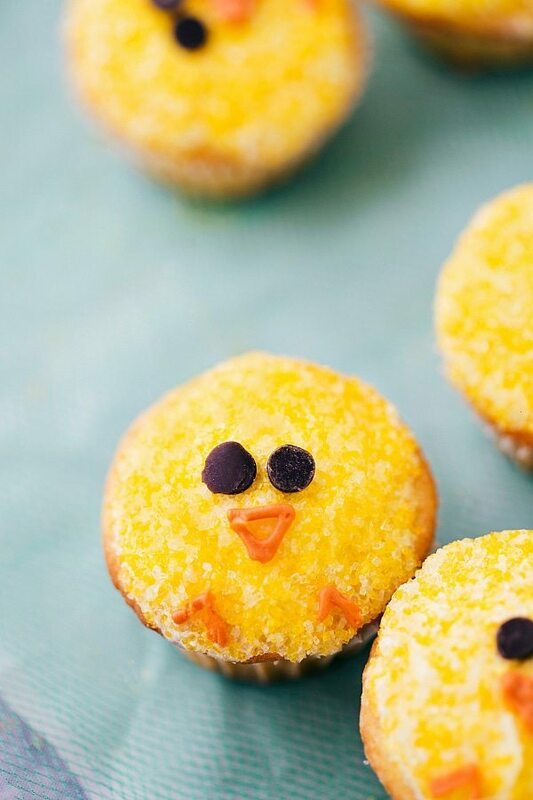 These cupcakes aren’t the first chick-decorated Spring treat to show up here…remember those cute chick chocolate covered strawberries a couple years back? I am considering doing those for Easter again this year. 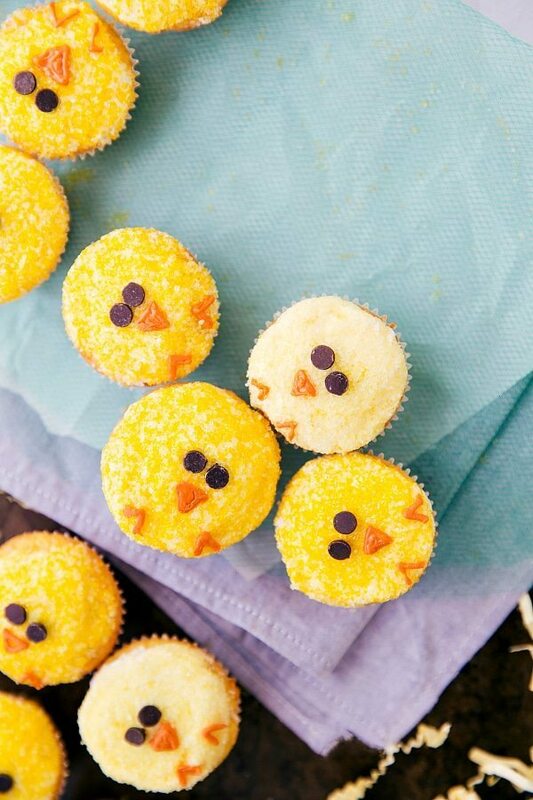 I’m on dessert duty this year so I’m thinking a carrot cake with all the cream cheese frosting, these little chick cupcakes, and perhaps those chocolate covered strawberries. What are your plans for Easter? It’s coming up quick! An Easter egg hunt is a must for us, but we don’t really get into the whole dying egg thing. (Am I the worst mom?! ?) 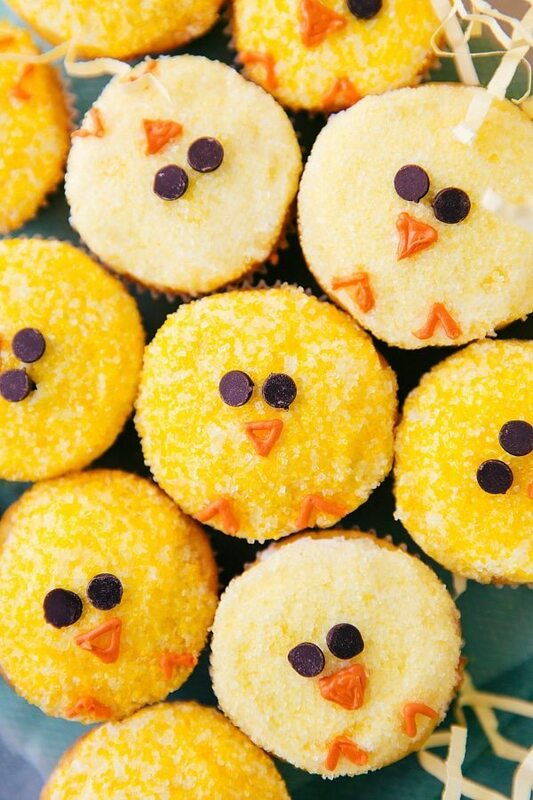 In place of dying eggs we usually make a cute treat like these cupcakes. SO I wanted the decorations to be super simple so the toddler could even help. And these are just that! The toddler loved dipping the frosted cupcake into a bowl with sprinkles and pressing the chocolate chips in for the eyes. Although we don’t dye eggs around here, I think decorating cupcakes is just as fun! Besides the actual decorations being so simple, the cupcakes are too. I use a Pillsbury yellow cake mix to make these miniature cupcakes. The toddler loves adding the water, eggs, and oil to the bowl and stirring it all together. Prepare the cupcakes according to package directions and allow to completely cool. Beat in the powdered sugar a cup at a time until well combined. I usually use around 3 cups, but it varies. Add until the frosting is to your desired thickness. Frost the cupcakes and then press the freshly frosted cupcakes into a bowl or rimmed plate filled with the sugar sprinkles. Pipe on a beak and little feet. How adorable, just the cutest things. These are so much better than the real thing. Thanks for sharing. Haha I do too usually! 🙂 Thanks so much Christin!! 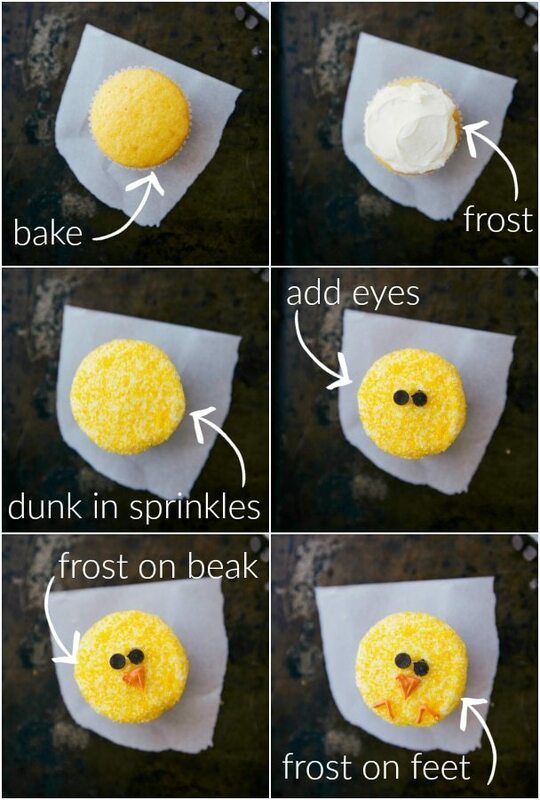 Adorable and so easy!! Thanks for sharing 🙂 I just ordered your book by the way and I’m LOVING it so far!